During August and October 1998, a salvage excavation was conducted at a number of sites along the southern part of Delilah Beach in Ashqelon (License No. B-131/1998; map ref. 158375–668/621462–625), prior to the construction of a promenade. The excavation, undertaken on behalf of AES, under the auspices of the Center for Maritime Studies of the University of Haifa, and underwritten by the Ashqelon Economic Company, was directed by R. Toueg, with the assistance of Z. Keinan (surveying) and D. Lipkonsky (administration). The excavation concentrated in two sections: Areas A–C at the western edge of a kurkar cliff, and Area D, c. 30 m south of the tomb of Sheikh ‘Awwad. During the course of development work, overseen by the Israel Antiquities Authority, forty-six rock-hewn hollows of various sizes, filled with dark hamra that contained potsherds, were exposed in the kurkar bedrock. Most of the hollows were severely damaged by mechanical equipment. Six hollows that contained potsherds were completely excavated. Area A (Fig. 1). Sixteen hollows were excavated and apart from four, all were devoid of any finds. Hollow 1 (1.50 × 2.35 m, depth 1.2 m), elliptical and oriented east–west, extended down into the layer of hamra below the kurkar. 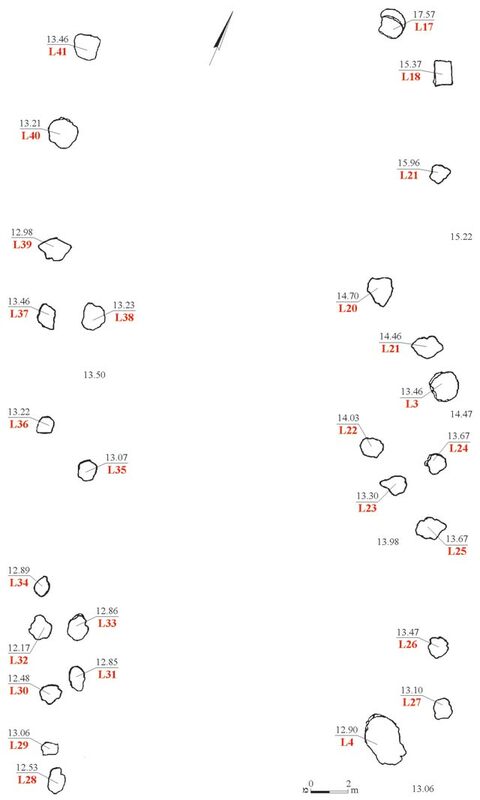 Remains of clay, characteristic of furnaces, were found on the western side of Hollow 2 (1.3 × 1.8 m, depth 0.4 m). Hollow 5 (length 1.45 m, depth 1 m) and Hollow 6 (length 2.7 m, depth 2.5 m), damaged by the earthmoving work, were partially excavated; it became clear that their size was originally larger. Areas B, C (Fig. 2). 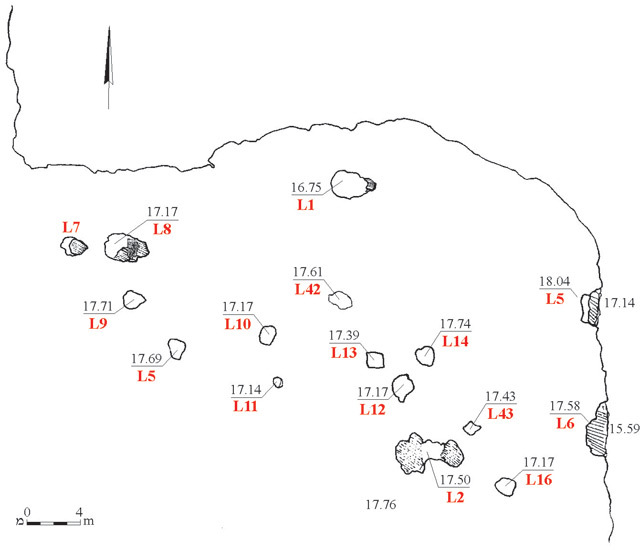 Fourteen hewn hollows in Area B and thirteen in Area C were excavated. Most were devoid of any finds, save two hollows: the circular Hollow 3 (diam. 1.45 m, depth 1.45 m), and Hollow 4 (1.6 × 2.2 m, depth 0.6 m), which was elliptical. Area D. Three hollows, devoid of finds, were excavated. The pottery vessels recovered from the hollows included handmade body fragments that contained a large quantity of straw temper. A few potsherds from the Byzantine period (seventh century CE) were found in a few hollows (3–6), although it seems that these were swept into the hollows and were not connected to their use. The nature of the finds in the hollows makes it difficult to date them, but it seems that they were from the Early Bronze Age. The poor state of preservation of the excavated hollows did not enable a reconstruction of their function; however, the lining remains in one of the hollows and the evidence of burning suggests that they were used as furnaces for smelting copper, like the hollows from the same period that had previously been excavated at the Ashqelon Afridar site (ESI 16:122–123) and c. 500 m south of the current excavation area (License No. B-150/1997). 2. Areas B and C, plan.